Getting to Versailles requires deciphering the French train system. You don’t take the Paris Metro, you take the RER C suburban train, but only one of the many that run in the direction of Versailles–the one whose “name” is VICK. 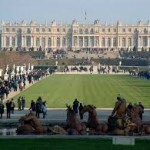 The others will branch off to parts unknown before reaching Versailles. And the station you want is Versailles Rive-Gauche, not the other one also labelled “Versailles.” Got that? If not, just follow the other tourists and French schoolchildren who seem to know the right train to use and where to disembark after about 45 minutes. 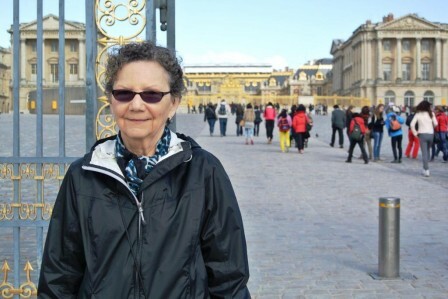 Ann at the gates of Versailles Chateau, ready to tackle the challenge. As far as I could tell, Versailles was filled mainly with large Asian tour groups, excited American tourists like us, and French schoolchildren. Americans love France, dating back to the time of the American Revolution, when France supported the colonies against Great Britain. 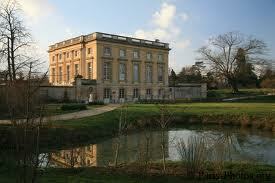 In the 1920’s, John Rockefeller Jr. gave about $20 million dollars to save and renovate Versailles. Other European groups are not so much in evidence at Versailles, probably because France was usually their military opponent and usually they lost, especially under Louis XIV. 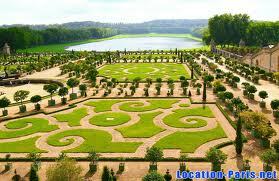 For over 150 years (1650-1789) Versailles was the seat of the most charismatic monarchy in Europe, the Bourbons. Conceived by the Bourbon monarchy as a solution to its political problems, unfortunately the chateau at Versailles and what it represented only added to those problems. It all ended with one of the most dramatic events in French history. In 1789 “the people” of Paris forcibly transported the reigning King, (Louis XVI) and his Queen (Marie Antoinette) from Versailles to Paris, then to jail, and a few years later to the guillotine. 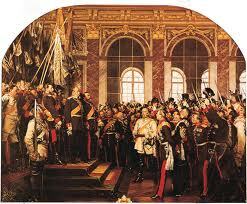 All over Europe, monarchs and their aristocracies quaked at the thought of the power of the French Revolutionists. 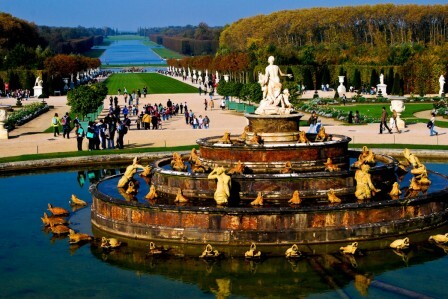 The name Versailles comes from the Latin word vertere, “to turn the soil.” In 1600 when the Bourbon monarchy first began to buy the land in this area, Versailles was a prosperous hamlet of 200 peasant families, 12 miles west of Paris. A windmill stood where the chateau now sits. In building this huge Chateau, Louis XIV was trying to solve the problem of rebellions led by the aristocracy, and so “the court” was required to live at Versailles. This term meant the vast royal entourage and the domestic employees needed to provide for them. No one knows how many aristocrats and their retinue were in the entourage at Versailles, but under Louis XIV probably several thousand. Astonishingly, and another fatal flaw for Louis XVI and Marie-Antoinette, the “court” had grown to 15,000 or so by their reign. Yes, 15,000 people, all to be cared for. 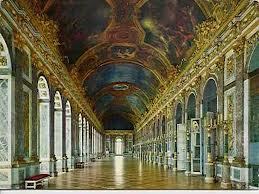 Like a large blocky hotel, Versailles contained over 300 lodging units of various sizes. 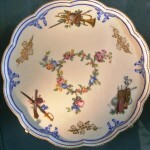 Versailles was self-sufficient, providing everything from theatrical staff to police to a judiciary for settling in-house disputes to musicians to numerous comfort-servants such as the cesspool-emptier assigned solely to the royal prince who was next in line for the throne, known as “the dauphin.” Merchants such as lacemakers who catered to the court were allowed to set up shop inside the palace; appropriately the chateau’s gift shop is now located in their former space. 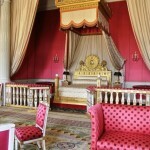 Rooms were not always nice and comfortable at Versailles. Sanitary facilities, water, heat, and especially private kitchens could be hard to come by. No wonder many notables preferred their own luxurious town-houses back in Paris. 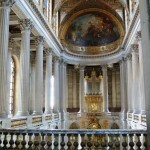 The Chateau of Versailles: it’s truly grand, and grandiose. 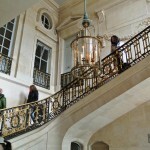 Not a square inch of the rooms (those open to the public) lacks gilding, marble, a chandelier dripping with crystal pieces, huge portraits monumental history scenes, or the finest in French fabrics. 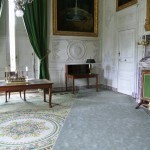 The secret door of her Marie-Antoinette’s bedroom. The Violin Room’s main theme is ” turn swords into violins.” Only possible because France had triumphed over its opponents. 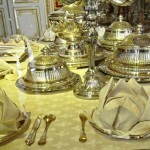 Dining Service. Even the napkins are folded into a grand design. The gardens: After several hours in the many gilded, dazzling rooms of the Chateau, our eyes needed something more natural. We braved the cold rain clouds coming our way and ventured into the formal gardens. 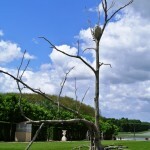 To the old gardens and their formally groomed trees and landscape, the curators in 2012 added new bronze sculptures of—TREES, the kind you find growing naturally in a real forest. Only they aren’t real, they’re sculptures. Amazingly, the “trees” make the formal gardens, made of natural material but clearly artificially groomed and tamed into geometric shapes, even more interesting. A stroke of French genius. 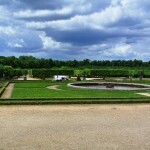 Next: to the Grand Trianon: We walked through the gardens and arrived at the Grand Trianon moments ahead of the storm. Some background: as the Versailles Chateau became a place of political/ court business, a stage to see and be seen, it became less of a royal home. 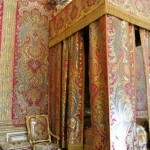 Louis XIV found he needed a private place-i.e. a pleasure palace–for himself. So he built two. Of course. Marly, a few miles away, was for the king and a few intimate friends. 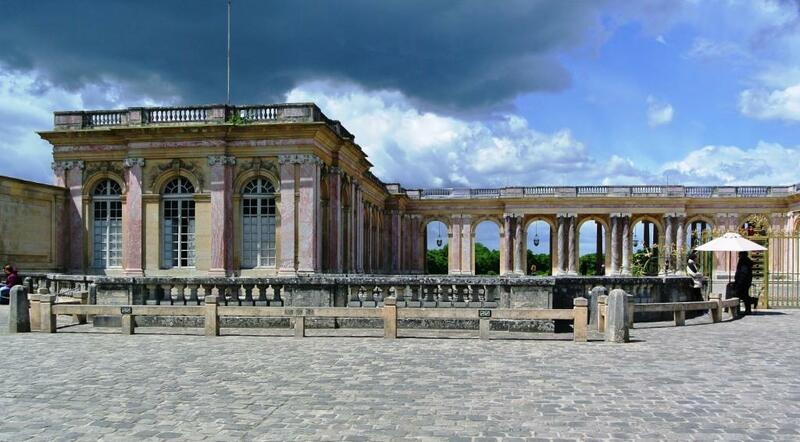 The other, on the NW grounds of Versailles itself, was the Grand Trianon, for himself and family. 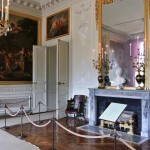 The Grand Trianon is much lighter in tone than the Chateau–less gilding, greater use of whites and blues–but it’s hardly an informal family home. 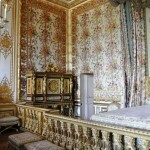 Royal Bedroom of Louis XIV. 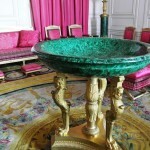 The rare green malachite bowl was a gift of Tsar Alexander I of Russia to the Emperor Napoleon. The Cotelle Gallery, built to shelter the gardens against the winter north winds. One of the Peace Treaties settling World War I was signed here, in 1920. It was lovely and above all restful, even in the downpour that finally let loose. The Petite Trianon: After the rain stopped, we continued on to the Petite Trianon, famous as Marie Antoinette’s even less formal retreat. To us, it appeared only marginally less formal. 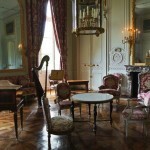 But at the time, the Petite Trianon was considered informal because of its lack of rigid court etiquette. Unfortunately for the future of the Bourbon monarchy, Marie-Antoinette (and her husband Louis XVI) craved privacy, retreating more and more from the great rooms of the Sun King’s Chateau. Unfortunate because the French equated a royal life lived in public with a morally reputable life, despite any evidence to the contrary. By hiding from the court and polite society, by seeking out a private life, and by embracing an informal style, Marie-Antoinette and Louis XVI fundamentally severed the public’s illusions about the divine right of monarchy. Marie-Antoinette even had a set of window mirrors installed so that no one could see into her new, very private boudoir, which of course put the gossip mill into overdrive. Another storm was approaching just as we ended our tour. We called it a day, headed for the train, remembering our great adventure (and the treat we had earlier from Angelina’s restaurant in the Chateau). I’m Tired. 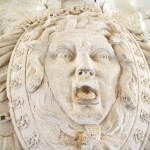 (Medusa Decoration, at the head of the grand staircase, Petite Trianon. 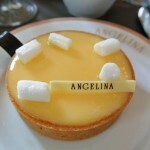 One of Angelina’s famous desserts, a lemon tart with foam marshmallows and white chocolate label. 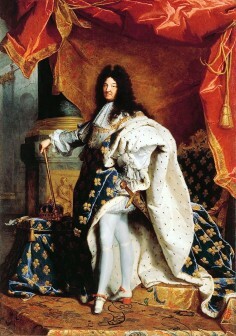 Louis XIII, father of the Sun King Louis XIV, acquired the hamlet of Versailles in the early 1600’s. He had been on a deer hunt in the area, liked the land, and bought it for a hunting preserve. He first built a simple country house, then a medium-sized country chateau in the French fashion of red brick with a blue slate roof. 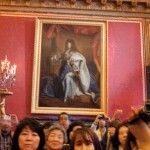 But it is Louis XIV that Americans associate with Versailles, along with Marie Antoinette of 100 years later. Louis XIV was first brought to Versailles at age 3 but took no interest in his father’s country estate until around 1661, when he was age 25 and had been King for some 18 years. He decided to use it as a retreat from the official royal country residence at nearby St. Germain-en-Laye, probably to enjoy his extra-marital trysts away from his wife and mother-in-law. Much more politically shrewd than his fellow European monarchs or even his own aristocracy realized, the young Louis also realized that by pouring lots ( and never-ending) of money into Versailles he could transform it into a power statement never before seen in Europe. 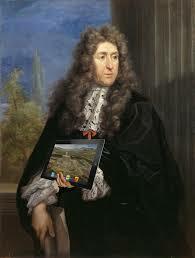 The Sun King’s first great passion were the park and gardens, to which he entrusted the landscape designer Andre Le Notre. So ambitious were their plans that entire villages were forcibly relocated, lest they interfere with the view. Nature was regimented, controlled, and improved upon. Lack water for the many many fountains and gardens? Just divert a river (the River Eure, 52 miles away.) The terrain became grand outdoor rooms, like some modern Southern California villa featured in “Architectural Digest. Once the grounds were established, Louis XIV’s publicity machine went into high gear, cranking out enormous royal fetes, with theatricals, fireworks, balls, banquets, and nighttime festivities. 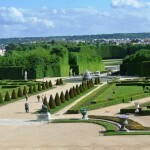 Versailles became the talk of Europe. Who was invited? Not merely former ambassadors and the high aristocracy of France who preferred Paris, but also nobles from the provinces and the rich burghers of Paris. 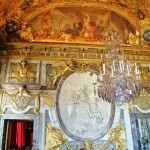 Louis XIV next turned his attention to his father’s house. The Sun King thought the new grand park and gardens and fetes deserved an equally grand house, including on-site lodging for lots and lots of the high nobility– a way, it turned out, of completely controlling them.The architect Louis Le Vau was chosen, and he delivered, followed on his death by Jules Mansart. 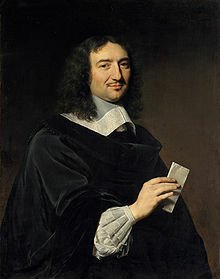 Jean-Baptiste Colbert, Louis’ unofficial director of government arts and officially the Finance Minister, began to object to the King’s lavish expenditure on Versailles. Louis had made an expensive mistake in not tearing down the old house first, leaving two distinct architectural styles that were hard to integrate. Colbert thought all this effort was at the expense of improvements to the Louvre (at that time a palace) in Paris. After all, Frenchmen considered the Louvre to be the seat of the monarchy. But Colbert died, and with him, any fiscal restraints upon Louis. Versailles became the “architectural monster” Colbert had feared, continually demanding money to harmonize the original house withthe new enormous wings, like “a little man with big arms and a large head,” as Colbert once put it. Ka-ching, ka-ching. Eventually, in 1682, and twenty years after he started his Versailles project, Louis officially abandoned Paris as the place where the monarch and court could be found and moved the court to Versailles; it became the one and only seat of power. The deal was sealed. 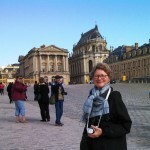 The Chateau of Versailles was like a small town. Visitors today don’t see this, as much of Versailles has been destroyed, sold off, or vastly altered since the French Revolution of 1789. 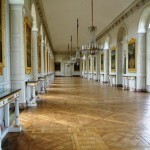 To accommodate “the court,” Versailles had kitchens, stables, lodgings for courtiers, multiple wings, hidden courts, private rooms and very very private rooms behind the public rooms that hardly anyone knew about. It was bigger than what’s inside the gates today: In the 18th c Versailles was the focus of a much larger complex scattered around the grounds and the town of Versailles. 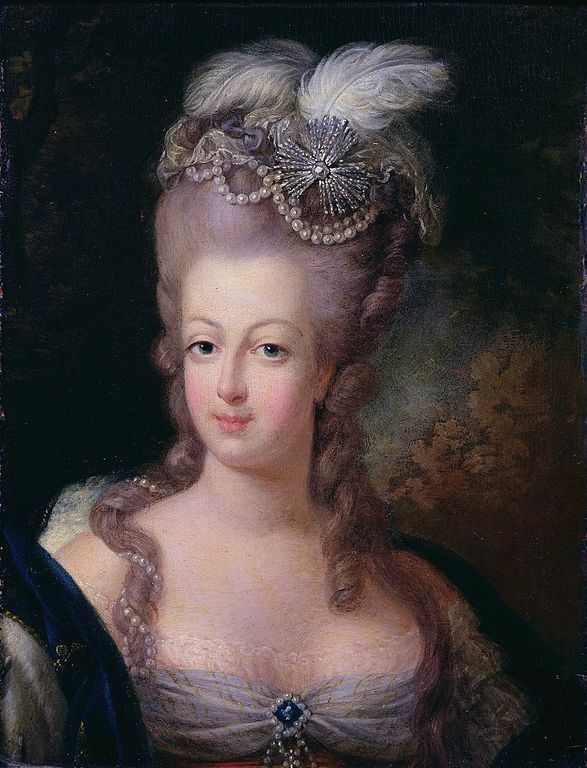 Marie-Antoinette is the most well-known 18th c. person to dwell at Versailles. 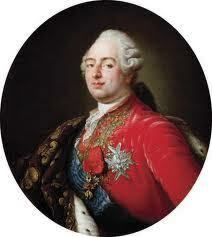 Her husband, Louis XVI, was the great-great-great-grandson of the Sun King, and a pretty timid guy, it appears. Charming and graceful, she partied; he piddled with small stuff like his lock-making workshop. 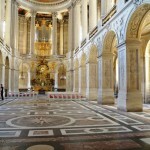 Louis XVI and Marie-Antoinette held court less and less often; in mid-week, Versailles was deserted. With today’s hordes of visitors, this is hard to imagine. In 1775, seeking more privacy, Marie-Antoinette persuaded her husband to give her the secluded house in the royal gardens known as the Petite Trianon. (“Petite” being a relative term when it comes to the Bourbon monarchs.) Other members of Louis’ close family built similar rural idylls close to the palace, so in itself her request was not unusual. However, as Queen she installed unheard-of mechanical devices to shut out the world–at Trianon, a system of mirrors that rose from the beneath the floor to cover the windows; a grotto with a mysterious lookout point; in the palace itself a set of complex, unusual inside locks for her two bedroom chambers which she operate from her bed. Marie-Antoinette was also fatally informal. She gave mixed signals about compliance with the ancient “etiquette of decency”, still in place, especially for the royal females. The rules for royals required two ladies-in-waiting to follow a Queen around at all times to protect her virtue. A Queen was never to eat with men, even the King’s brothers, in the King’s absence. 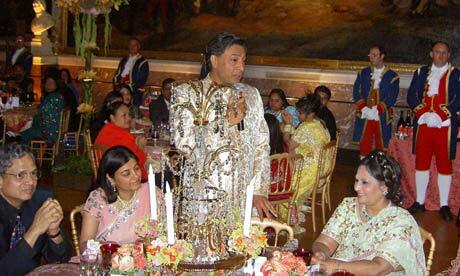 Royal females were segregated from nonroyal men at meals, even when the King was present. A gentleman was never to put his hand on the back of a woman’s armchair. For aristocratic women, adultery was not forbidden but unfaithfulness to one’s husband (in public or in politics) certainly was. For females of royal blood, adultery could be treasonous because future offspring might not be the King’s and overturn the foundation of dynastic succession. Not the kind of rules that Marie-Antoinette’s liked. The Bourbon monarchy fell during the French Revolution, the people carted Marie-Antoinette and Louis XVI and their children off to Paris in 1789, and in January 1793 the King and Queen were beheaded. 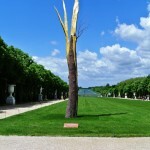 What happened to Versailles after the monarchy came tumbling down? The new republican government didn’t quite know what to do with this white elephant. Obviously it did not fit in with the conception of the new French state, now shed of its monarchy. Would Versailles be demolished for the value of its building materials, as happened to many monuments and buildings of the ancient Roman Empire? The Republic decided to keep all the old royal residences, but sold off parts of the land. The Grand Canal was drained and turned into pasture. 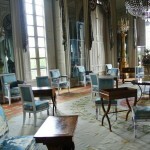 Marie-Antoinette’s Petit Trianon was turned into an inn by a maker of lemonades.Then the Republic truly started to run short of money, as it fought aggressive foreign wars against Austria and England; a massive sell-off of the possessions and furnishings of Versailles began, many of them landing in English and German aristocratic stately homes. Napoleon, taking over the French Revolution for his own ends, did not move into the Versailles Chateau though he had some rooms at the Grand Trianon, and so it is not associated with the Bonapartist dynasty. After Napoleon’s final defeat in 1815, Versailles drifted in purpose until it was turned into a patriotic and military museum. 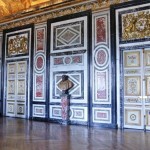 One of the few rooms that remained in its original form was the Hall of Mirrors. The Hall of Mirrors became a symbol of French nationalism in the later 19th c. In 1871, the Germans defeated the French in the Franco-Prussian War. The Germans made the French sign the preliminary treaty of surrender at Versailles and in the Hall of Mirrors proclaimed the Prussian King “Kaiser” ( Kaiser Wilhelm of the newly-formed German Empire). The French didn’t forget this humiliation, and returned the favor with the defeat of the Germans and their allies in World War I. 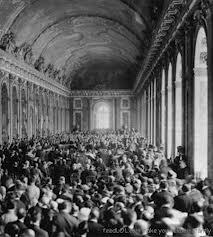 Thus we Americans remember the Hall of Mirrors as the place where “the Treaty of Versailles,” was signed. By the 20th century, French attitudes toward the monarchy had come full-circle, and Versailles as the representation of absolute monarchy was no longer an embarrassment. 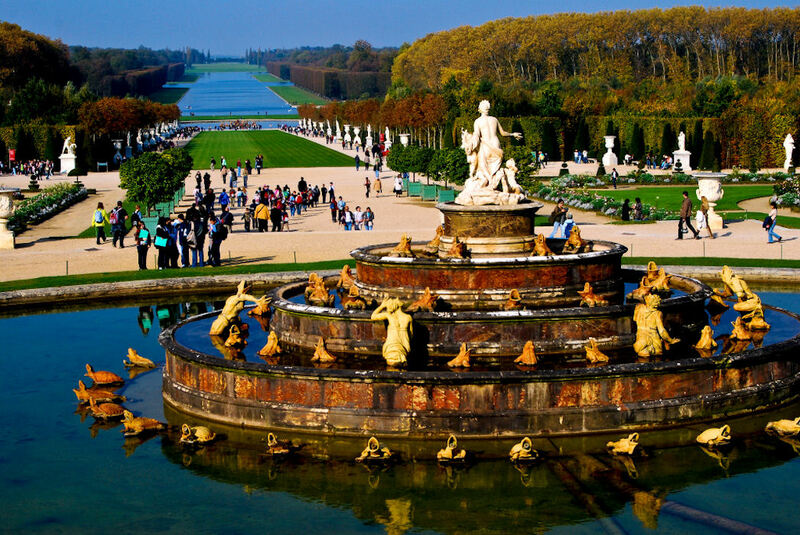 With massive recent funding from the French state, Versailles resurrected.The gardens of Louis XIV, the absolute monarch Sun-King and hated by his fellow Europeans, have been restored. They are now lucrative photo-shoots for high-fashion folks like Karl Lagerfeld. 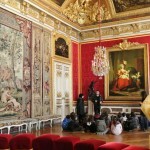 For the interior, French curators aim to re-create the palace as it looked in 1789, the eve of Louis XVI’s and Marie Antoinette’s departure for Paris and the guillotine. To fund this vast task, the restored interior of Versailles is available for hire as an international luxury brand, shown by the sumptuous wedding feast thrown there by the Indian steel tycoon, Lakshmi Mittal, in 2004. 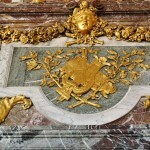 This entry was posted in Architecture, Historical People and tagged gardens, Le Notre, Louis XIII, Louis XIV, Louis XVI, Mansart, Marie-Antoinette, parks, Versailles gardens, Versailles history, Versailles parks on Thursday, May 30, 2013 by Nancy J Padgett. Enter your email address to receive blog updates delivered to your inbox.